In the double slider mechanism two sliding element are used so this mechanism is the combination of two turning pair and two sliding pair. 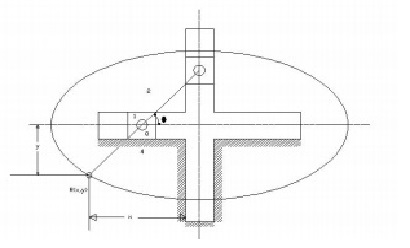 Elliptical trammel is a drawing tool which is used to draw ellipse. In this mechanism a slotted lever is used in which two groves are introduced. Both the slider moves along these groves. the important thing is that these two groves are perpendicular to each other. while slider are in the groves a connecting rod is used to connect these sliders and make the motion constrained. The slotted Lever is fixed element in the mechanism. When the sliders will move along the grooves, every point on the connecting rod will have a locus of an ellipse. Different points of connecting rod will draw a different ellipse. Scotch yoke Mechanism Transforms the rotational motion into a translatory motion. A rotatory crank is connected with a slider which will move in a slotted Lever. The Other sliding element is connected with the lever will reciprocate as an output of the mechanism. The Lever and the slider are connected such that they both are one element i.e. they are fixed together to make a single element. Oldham's coupling is a mechanism to transform rotational motion from one shaft to another. these two shafts will not have the common axis but their axes will have slight difference difference between them and are parallel to each other. When one shaft rotates the other will rotate with the same RPM. 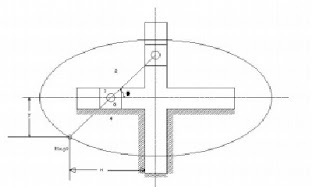 The flanges are incorporated at the ends of the shaft to provide coupling. these flanges are brought together to make a joint. between the flanges a circular disc is introduced. this disk has slots that are fit into the flanges to provide a joint. The input shaft will transfer the rotational motion to circular disc throw flange then the disk will transfer that to another flange to rotate the other shaft as output.